The wildly scenic Red Canyon Overlook is one of those must-see photo stops along your tour of Flaming Gorge Country. Located next to the Red Canyon Visitor Center, the overlook towers above scenic Red Canyon, about 700 feet wide and 1400 feet straight down! Below, the serene waters of Lake Flaming Gorge winds its way around this point, but don't drop your camera - the lake is about 250 feet deep here! The Overlook is open year-round and offers an interpretive trail, restrooms and a wide, easy paved trail to each view that is fully accessible. Wildlife is common here - bighorn sheep and mule deer are frequent visitors. The popular Red Canyon Rim Trail are also begins here. Located at the end of the well signed Red Canyon Road, off mile 3.5 of UT Hwy 44. 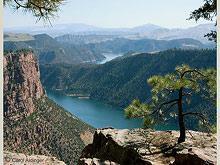 Thank you for visiting http://www.flaminggorgecountry.com/Red-Canyon-Overlook! Be sure and revisit flaminggorgecountry.com frequently for content updates and more.